The famous Sikh Gurdwara Golden Temple in Amritsar, Punjab, India. Amritsar is a beautiful city in the northwestern Indian state of Punjab. 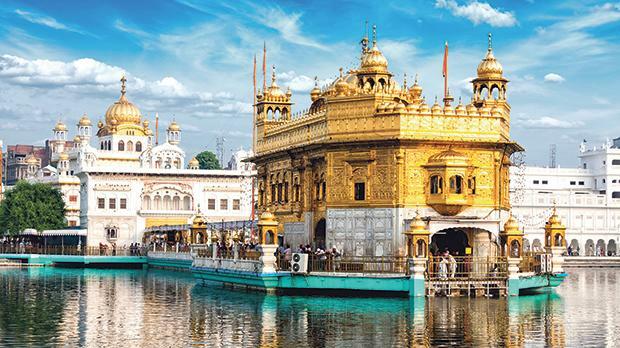 Its Golden Temple, the holiest site in Sikhism, was constructed in the 16th and 17th centuries. Its gold-encrusted walls and chandeliers attract millions of visitors and pilgrims annually. This same city has a bloody past which points to the more sinister elements of statecraft. A century ago protests broke out objecting to the British colonial presence in India and in favour of a higher degree of home rule. In Amritsar, some of these protests turned violent; some Europeans were killed and public buildings and banks were raided and looted. Brigadier-General Reginald Dyer was sent to restore order. Restrictions were in place to try and prevent demonstrations and other gatherings. The news of the imprisonment of Indian nationalist leaders, including Mohandas Gandhi, led to renewed protests. Thousands of unarmed civilians gathered at the Jallianwala Bagh – a walled enclosure near the Golden Temple. A force of 90 Gurkha and Indian soldiers opened fire without warning for a quarter of an hour. According to an official figure, 379 were shot dead and over a 1,000 individuals were wounded. The estimates published by the Indian National Congress suggest that 1,200 were killed. Due to the imposed curfew, many of those who died were left out all night in the place where they fell. Some praised Dyer’s actions since they led to a rapid pacification of Punjab. Others condemned the massacre vociferously. Winston Churchill described the events as “monstrous” – “an event which stands in singular and sinister isolation”. Dyer was eventually censured and forced to resign from the Indian Army. Amritsar was also the location of another tragedy. This took place 35 years ago in 1984. A year before this massacre, the militant religious leader Jarnail Singh Bhindranwale took up residence in the Golden Temple to evade arrest. Within this sacred complex, he set up various structures related to the armed separatist Khalistani movement which sought to gain independence from India. Bhindranwale’s group was responsible for the death of 165 Hindus. The government, led by Indira Gandhi, ordered a military operation code-named ‘Operation Blue Star’ to remove Bhindranwale from the Temple complex. The Sikh militants refused to surrender to the Army’s order. As a result, a three-day armed conflict ensued. Bhindranwale died, and the militants were removed from the Golden Temple. Official statistics report that 493 people died. In retaliation, in October 1984, Indira Gandhi was assassinated by her Sikh bodyguards at her residence. This led to a pogrom against the Sikhs tacitly encouraged by some leaders of the Indian National Congress Party. Sikh neighbourhoods were targeted indiscriminately over several days. These two tragic episodes give us scope to look at the trajectory of modern statehood and the nature of the nation state. In his lecture on ‘Politics as a Vocation’, the German sociologist Max Weber attempts to reach a definition of what constitutes the modern state. The contemporary state tries to set up political organisations to govern legitimately. More controversially, Weber believes that the state is the only community which can claim “the monopoly of the legitimate use of physical force within a given territory”. This in itself is the result of a curious paradox; the state can use force legitimately, but it is not the only entity which resorts to violence. Thus, because of violent behaviour, the state may be required to act in self-defence. The controversy arises when one attempts to determine what constitutes legitimate force. The legitimate use of force does not equate to a wanton use of violence, brutality, and repression. The above two cases from the city of Amritsar reveal two political trends which should not be ignored. The first is that the crimes constituted in colonial regimes are often subject to higher scrutiny than the crimes of post-colonial governments. While the actions of colonial administrations should be unearthed and, where necessary, subject to historical assessment and political accountability, we must not forget to hold post-colonial governments to the same scrutiny and judgement. Such governments took office on the promise of freedom, justice and emancipation. Their ability to deliver on such promises affects the welfare of their citizens and will impact the global world system and the international political economy. By letting them off easily, the international community causes a disservice. The second point to be raised is that the monopoly on violence does not correlate to having free reign to use violence. The legitimate use of force by states often leads to a questioning of the legitimacy of the state. Governments that have employed force against their citizens dent their credibility and their legitimacy through their inability to deal with issues according to democratic norms – or, rather, through dialogue, negotiation and respect for differing views and opinions. The two episodes mentioned above do not question the need to use force if (or when) groups threaten the integrity of the state. Instead, they point to the necessity of institutions which can prevent the wanton use of violence, bring individuals to the discussion table and provide a measure of justice in the wake of gross wrongdoing. When the state has no alternative but to use force against its citizens, it dents its legitimacy. It would be a glaring admission that its institutions have failed or are not functioning as they should.